The fast growing Sydney-based start-up already counts Coca Cola, RIM, Johnson & Johnson and Unilever amongst its clients and has just implemented a major new project for Australian carrier Telstra. Sydney-based NFC advertising specialist Tapit, formed in 2011 with an initial A$900,000 (US$919,000) in funding and grants, has begun the process of raising Series A funding to fuel further expansion. The company’s clients already include a host of global brands, including Coca Cola, RIM, Johnson & Johnson, Unilever and Vodafone. Most of Tapit’s work to date has been in Australia and Singapore, Tapit’s CEO and co-founder Jamie Conyngham has told NFC World, but international projects are also now scheduled for the UK, Portugal, Dubai and Vietnam. “Just about all of our fixed and campaign based clients use QR and NFC side by side, both going through the Tapit servers,” Conyngham says. “So we get to compare like for like. Some of our clients are achieving up to 25% NFC interaction versus 75% QR interaction in the Tapit ecosystem… This is amazing as NFC penetration is estimated at only 3% to 5% of phones whereas QR capable phones are at about 50%. Tapit is currently managing Australian mobile network operator Telstra’s first NFC advertising campaign. 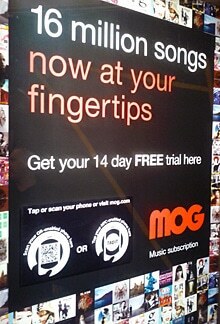 347 advertising panels in Sydney and Melbourne, operated by out-of-home media giant JCDecaux, have been equipped with NFC tags to allow consumers to tap their NFC phones to get a free trial of MOG, Telstra’s new music platform. Other projects include an NFC and QR code-based walking tour of Sydney’s historic Rocks district, a promotion for the Allphones Arena, a scratch card game for SA Lotteries, a waste recycling project and an out-of-home advertising network managed by Clear Channel in Singapore.